I don't want to criticize any other designers, but I have to say that many of the people involved in this industry - directors and producers - are trying to make their games more like movies. They are longing to make movies rather than making video games. Games have grown and developed from this limited in-the-box experience to something that's everywhere now. Interactive content is all around us, networked, ready. This is something I've been hoping for throughout my career. A delayed game is eventually good, but a rushed game is forever bad. I don't really think of things in terms of legacy or where I stand in the history of Nintendo or anything like that. I don't think as a creator that I could create an experience that truly feels interactive if you don't have something to hold in your hand, if you don't have something like force feedback that you can feel from the controller. Actually, 3D is really the most normal thing because it's how those of us with two eyes usually see the world. TVs are the unusual things in 2D! I know as a child, I was really interested in becoming a manga artist, to create my own stories and illustrate them and present something that people would be interested in reading and looking at as well. Anything that is impractical can be play. It's doing something other than what is necessary to continue living as an animal. I enjoy thinking about ways to create something that other people have not even thought about, something no one has managed to achieve. New Updates! (4/26/2019) We've been working really hard on completing our membership system so you can submit quotes and keep track of them. Once this is complete in the coming weeks there will be a lot more quotes by Shigeru Miyamoto and other authors. We've also changed the sorting on the site so you now see the latest Shigeru Miyamoto quotes first. 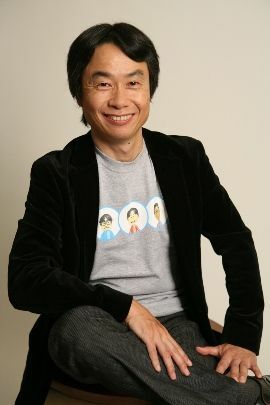 Our goal is to have the best Shigeru Miyamoto quotes on the web!